One of the loveliest and most historic cities in the United States is Annapolis, Maryland, incorporated in 1708 and the nation’s capital from November 1783 until August 1784. When visiting the town, and stepping back to the 18th century, what could be more appropriate than listening to all the news from the Internet of that day…a town crier? Criers, dressed in traditional period clothing such as a caped coat, breeches and a plumed tricorn hat, carry a handbell to attract people's attention, as they shout the words "Oyez, Oyez, Oyez!" before making their announcements. (The word "Oyez" means "hear ye," which is a call for silence and attention.) 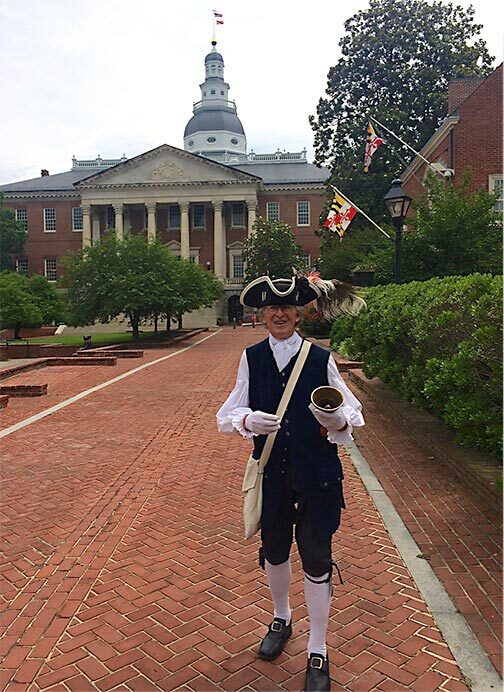 In Annapolis, the town crier also serves as a guide to the local sights. Any trip to Annapolis must include a visit to the United States Naval Academy. NOTE: Security is very tight at the Academy and visitors should check http://www.usnabsd.com/for-visitors/ ahead of time to make sure they have the right identification. It can be disappointing to be turned away at the guard station. A variety of walking tours are available and add to the enjoyment. Guides talk about midshipmen life and provide commentary on the major attractions in the Yard, including Bancroft Hall (the largest single dormitory in the world), Memorial Hall, the Statue of Tecumseh, the Herndon Monument, and the Main Chapel. Don’t miss the Crypt of John Paul Jones, Revolutionary War naval hero, whose remains were interred into the crypt beneath the Naval Academy crypt in 1906 in a ceremony presided over by President Theodore Roosevelt. The crypt lighting evokes an underwater setting. In the deck around the crypt are inscribed the names of Jone’s ships: Bonhomme Richard, Alliance, Serapis, Ariel. Alfred, Providence, and Ranger. As you walk through the campus, look for the famous flags of the U.S. Navy and captured flags from enemy ships. By common consent, the most famous, displayed in Memorial Hall, is the "Don't Give Up the Ship" flag flown by Commodore Oliver Hazard Perry at the Battle of Lake Erie on 10 September 1813. Oh, and did you know? The academy's Latin motto is Ex Scientia Tridens, which means "Through Knowledge, Sea Power." The Maryland State House is the oldest state capitol in continuous legislative use (since 1772). During the day it brims with activity, but it may be at its most evocative when the last person leaves and a lone figure stands within…a life-size statue of George Washington, posed on the spot where, on December 23, 1783, he resigned his commission to the Continental Congress. Washington’s personal copy of his resignation speech is on display in The State House rotunda. On top of the State House is a lightning rod installed just as instructed by its inventor, Benjamin Franklin. On the grounds is a statue of Maryland native Thurgood Marshall, the first black U.S. Supreme Court justice. Annapolis is closely connected with the immensely popular 1976 book Roots: The Saga of an American Family, written by Alex Haley. Roots tells the story of Kunta Kinte, an 18th-century African, captured as an adolescent, transported on a British slave ship to Annapolis in the British colony of Maryland, and sold into slavery. The story follows his life and the lives of his descendants down to author Haley. The Kunta Kinte-Alex Haley memorial on the Annapolis waterfront, portrays Alex Haley seated, reading from a book to three children. The state of Maryland was named after Henrietta Maria of France, the queen consort of England, Scotland, and Ireland as the wife of King Charles I. * Maryland is the only state in the United States whose judges wear red robes. *The Maryland State flag is the only state flag to be based on English heraldry. The black and gold design on the quartered flag is based on the coat of arms of the Calvert family. AND REMEMBER: When you’re traveling, you are what you are right there and then. People don’t have your past to hold against you. No yesterdays on the road. William Least Heat Moon.